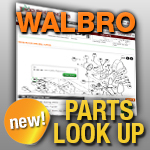 Walbro carburetor gaskets can shrink and cause air and fuel leaks. If your Walbro Carb needs replacement gaskets look below to find the proper gaskets or gasket and diaphragm kit you need to make repairs. All Walbro Carbs have a model number stamped into the Carb to help you find the correct replacement parts for your project.